It took the 4 Gods millions of years to create their world. You have 30 minutes! 4 Gods is a real-time strategy game of puzzle construction and strategic positioning. Players collaborate to build a planet together - while also competing for ultimate influence over it. 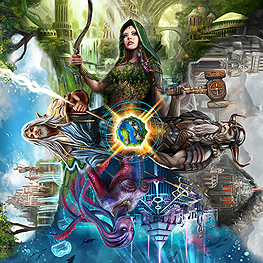 Become the Goddess of the Elves or the Merfolk, or the God of the Dwarves or the Humans, and create a new world each time you play. Players make moves simultaneously; no waiting for your turn! In fact, the more players there are, the faster the game goes, Every second counts!